Hey… I love Cole Hann too! I grabbed a pair of Mules last year at a very good price. Show your Cole Hann bags leh.. i like to see them! I can see that you like shopping too! Hi PB.. doing this again.. I visited MO last year and got a good deal for a pair of white Cole Hann mules… I must say the shoes are pretty attractive, only prob is sometimes the sizes are not available. Show your new bags ya? I got absolutely $%^&ing lost ytdy while trying to search for this place. Eventually made my way there. Bought a pair of Stuart Weitzman heels and I am now over the moon. I love Cole Haan too.. show your bags, PB! And they had Tod’s going for half the usual retail price… which is why I’m bringing Top Monkey back today. Hehe. Ive always wanted to go there!!! but im not very good with cheras area…. Good post ! 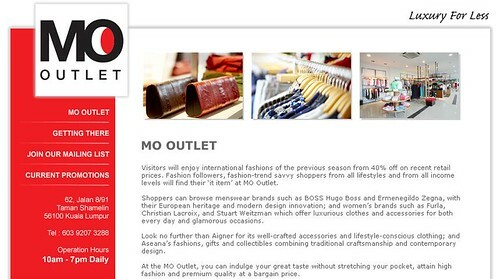 Are these clearance articles run by the marks or by the MO outlet itself ? @Gigi : Deals are available all year round here for off season items. Melium is the company that brings in the brands. Not sure what you mean by “marks”? How much did your cole haan bags cost?